Colbi Borland at state indoor track meet. The 26th-seeded Golden Eagles had a potential game-tying shot rim out with 2:30 to go in the fourth quarter and the third-seeded Tigers made just enough plays down the stretch to pull away for a win in Wednesday’s (March 6) Division I district semifinal at Gahanna Lincoln High School. Big Walnut, thanks to a pair of second-quarter threes from Carson Becker, a couple hoops from Kegan Hienton and another from Nathan Montgomery, led 21-20 at the break. Pickerington Central started the second half with a burst, though, going up by as many as eight points before ultimately outscoring the Eagles 16-12 in the third. The Tigers won the fourth 13-6 to smooth out the scoring summary. Brody Lawhun led BW with 12 points in the setback while Hienton added 10 and Becker finished with nine. Javohn Garcia had a game-high 18 points for Central. Kaitlyn Morrison rolled a solid 534 series to lead Big Walnut during Friday’s (March 8) Division I State Girls Bowling Tournament at Wayne Webb’s Columbus Bowl. The senior’s best game, which culminated with a 210 score, was her first. She followed it up with a 157 in the second and a 167 in the third. Morrison was 31st among individuals. As a team, Big Walnut finished 15th during the qualifying rounds with a combined team score of 2,686. Stow-Munroe Falls finished with a tourney-best 3,265 during qualifying, but fell to Centerville, the eventual state champ, in the championship round. Other Big Walnut contributors included Autumn Leidtke (481), Ashleigh Westervelt (447), Anna Tanner (419) and Caitlyn Lambert (405). Delaware Hayes’ Kelsey Rohrer was also in action. The senior, competing as an individual, finished 45th overall with games of 164, 207 and 140 (511). Colbi broke her own school record and placed 15th in a tough field of Division I runners. I love her attitude, when she came off the track she was not satisfied, and went through things she knows she can improve upon next year. This, and the fact she absolutely loves running, is why she is a three-time OCC champion in Cross Country, a two-time Indoor State qualifier, a two-time Regional qualifier and placer in Track, and a six-time OCC Champion in Track and Field. Kaley high jumped 5’ 0” and missed getting on the podium by one miss. Let me brag a little bit about what Coach Ryder has accomplished over the past decade and a half since the State Indoor began in 2005. Since 2005, Coach Ryder has coached nine Indoor State Qualifiers in the High Jump, and nine Indoor State Qualifiers in the Long Jump. Since 2009, when the Triple Jump was first introduced at the Indoor State level, Coach Ryder has had 13 Indoor State Qualifiers in that event. That’s a nearly 40% success rate at getting a jumper to the state meet. He has also coached five Indoor State Champions and ten additional Indoor State Placers for Big Walnut. Those are incredible numbers! • At the Feb. 21 school board meeting Mac Podraza was named Volleyball 2nd Team All Ohio. • Athletic information can be found on the website @ https://bigwalnutathletics.net/ sport team information is under the Fall-Winter-Spring tabs and additional athletic information is under the MORE tab. • Any senior that is going to play a sport at the college level and has not already spoken to Mrs. Piper about it; please see Mrs. Piper in the Athletic Office. • The Big Walnut “12 Seasons of Greatness” information can be found out https://bigwalnutathletics.net/2018/11/30/12-seasons-of-greatness/. Please see Mrs. Piper in the Athletic Office if you have met the criteria. • On Tuesday, March 12, 2019 there was a fundraiser at PJ’s Family Restaurant. 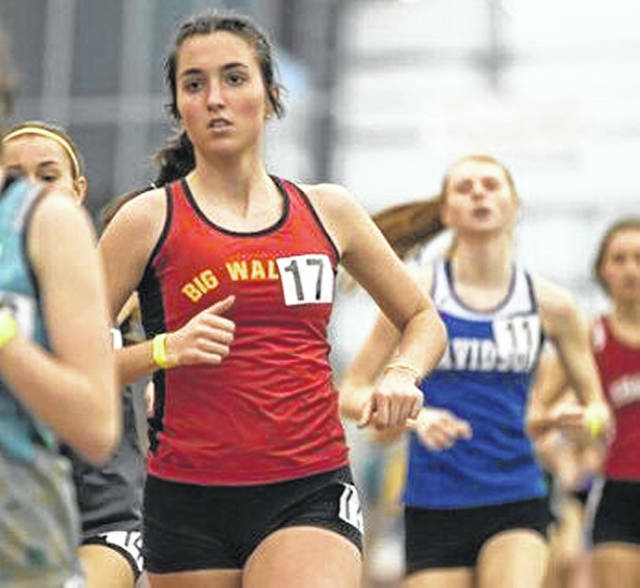 They teamed up with the Big Walnut High School Girls Track team to help them raise money for their program. • Big Walnut’s Elijah Wince, Damon Warren and Graham Mackey headed with the Northeast Storm Hockey Club to the Ohio State High School Hockey League final championship in Cincinnati last weekend. COLUMBUS, Ohio – The Ohio High School Athletic Association girls basketball state tournament takes center stage this week at the Schottenstein Center, while the boys basketball tournament has reached the regional round. The OHSAA’s wrestling, ice hockey and bowling state tournaments all concluded Saturday, March 9. After the wrestling state tournament, the Wrestlers of the Tournament were announced, which include Padraic Gallagher (Lakewood St. Edward) in Division I, Jordan Decatur (Cuyahoga Falls CVCA) in Division II and Dylan D’Emilio (Genoa) in Division III. State tournament coverage for those three sports can be found on their respective sport pages at www.OHSAA.org. Ticket information for the OHSAA’s girls and boys basketball state tournaments at the Schottenstein Center is posted at https://www.ohsaa.org/TheSchott – which includes all-session and single-session tickets, special group ticket offers and information about suites. In addition, on Saturday morning, March 16, the OHSAA will sponsor a basketball Champs Clinic for youth in 4th through 8th grades. Rankings are from the Final Associated Press Poll released on Monday, February 11, 2019. Home Team Listed First. No. 3 Waynesville (26-0) vs. No. 6 Doylestown Chippewa (25-1), Thursday, 3 p.m.
Akron St. Vincent-St. Mary (18-9) vs. No. 1-tie Dayton Carroll (26-2), Thursday, 6 p.m.
No. 4 Toledo Rogers (25-2) vs. No. 5 Thornville Sheridan (25-2), Thursday, 8 p.m.
No. 6 Ottoville (24-3) vs. Shadyside (24-4), Friday, 3 p.m.
No. 7 Canton GlenOak (24-2) vs. No. 4 Cincinnati Mount Notre Dame (25-2), Friday, 6 p.m.
No. 1 Pickerington Central (27-1) vs. Toledo Notre Dame Academy (23-5), Friday, 8 p.m. Dates, Locations and Times Subject to Change. Records Indicated are as of District Final from Available Information. Rankings are from the Final Associated Press Poll released on Monday, February 18, 2019. Home Team Listed First. Lima Senior (21-4) vs. Toledo Start (21-3) at University of Toledo, Savage Arena, Wednesday, 7 p.m.
No. 7-tie Akron St. Vincent-St. Mary (21-4) vs. Olmsted Falls (24-2) at University of Akron, Rhodes Arena, Wednesday, 7 p.m.
Green (17-4) vs. Mentor (23-2) at Cleveland State University, Wolstein Center, Wednesday, 6:15 p.m.
Euclid (16-8) vs. Lakewood St. Edward (17-8) at Cleveland State University, Wolstein Center, Wednesday, 8 p.m. Regional Final: at Cleveland State University, Wolstein Center, Saturday, 2 p.m.
Pickerington North (21-5) vs. Newark (20-6) at Ohio Dominican University, Wednesday, 7 p.m.
Powell Olentangy Liberty (22-4) vs. No. 2 Pickerington Central (24-1) at Ohio Dominican University, Thursday, 7 p.m. Regional Final: at Ohio Dominican University, Saturday, 2 p.m.
Liberty Township Lakota East (18-6) vs. No. 1 Cincinnati Archbishop Moeller (25-0) at Xavier University, Cintas Center, Wednesday, 6:15 p.m.
Springfield (16-9) vs. No. 10 Centerville (21-5) at Xavier University, Cintas Center, Wednesday, 8 p.m. Regional Final: at Xavier University, Cintas Center, Saturday, 7 p.m. Region 2 vs. Region 4, Fri., March 22 at Jerome Schottenstein Center, 6 p.m. Region 3 vs. Region 1, Fri., March 22 at Jerome Schottenstein Center, 8 p.m.
Division I State Championship: Sat., March 23 at Jerome Schottenstein Center, 8:30 p.m.
Cleveland Villa Angela-St. Joseph (18-7) vs. Cleveland Benedictine (17-12) at Canton Memorial Civic Center, Wednesday, 6:15 p.m.
Akron Buchtel (18-7) vs. Poland Seminary (23-2) at Canton Memorial Civic Center, Wednesday, 8 p.m. Regional Final: at Canton Memorial Civic Center, Friday, 6:15 p.m.
No. 2 Columbus South (22-1) vs. Norwalk (24-3) at Bowling Green State University, Stroh Center, Thursday, 6:15 p.m.
Cleveland Central Catholic (13-9) vs. Lima Shawnee (22-2) at Bowling Green State University, Stroh Center, Thursday, 8 p.m.
at Bowling Green State University, Stroh Center, Saturday, 2 p.m.
Thornville Sheridan (19-5)/Jackson (18-7) vs. Steubenville (19-5) at Ohio University, Convocation Center, Wednesday, 6:15 p.m.
No. 10 New Philadelphia (22-4) vs. Chillicothe Zane Trace (21-5) at Ohio University, Convocation Center, Wednesday, 8 p.m. Regional Final: at Ohio University, Convocation Center, Saturday, 7 p.m.
Cincinnati Aiken (17-6) vs. No. 1 Trotwood-Madison (25-2) at Kettering Fairmont High School, Thursday, 5:30 p.m.
Dayton Northridge (18-7) vs. Columbus Bishop Hartley (17-11) at Kettering Fairmont High School, Thursday, 8 p.m. Regional Final: at Kettering Fairmont High School, Saturday, 3 p.m. Region 7 vs. Region 6, Thurs., March 21 at Jerome Schottenstein Center, 6 p.m. Region 5 vs. Region 8, Thurs., March 21 at Jerome Schottenstein Center, 8 p.m.
Division II State Championship: Sat., March 23 at Jerome Schottenstein Center, 2 p.m.
Mogadore (19-7) vs. No. 6 Ashtabula Edgewood (24-1) at Canton Fieldhouse, Wednesday, 6:15 p.m.
Cleveland Heights Lutheran East (19-8) vs. Orrville (17-8) at Canton Fieldhouse, Wednesday, 8 p.m. Regional Final: at Canton Fieldhouse, Saturday, 7 p.m.
Grandview Heights (21-7) vs. Oregon Cardinal Stritch (22-3) at Bowling Green State University, Stroh Center, Wednesday, 6:15 p.m.
Coldwater (17-9) vs. Willard (21-3) at Bowling Green State University, Stroh Center, Wednesday, 8 p.m. Regional Final: at Bowling Green State University, Stroh Center, Saturday, 7 p.m.
No. 3 Wheelersburg (25-0) vs. Magnolia Sandy Valley (17-6) at Ohio University, Convocation Center, Thursday, 6:15 p.m.
No. 2 Canal Winchester Harvest Prep (24-2) vs. Frankfort Adena (20-6) at Ohio University, Convocation Center, Thursday, 8 p.m. Regional Final: at Ohio University, Convocation Center, Saturday, 3 p.m.
No. 5 Cincinnati Purcell Marian (20-5) /New Paris National Trail (19-5) vs. Versailles (15-10) at Kettering Fairmont High School, Wednesday, 5:30 p.m.
Dayton Stivers School for the Arts (19-4)/Cincinnati Deer Park (15-7) vs. Cincinnati Clark Montessori (17-9)/No. 8 Anna (23-2) at Kettering Fairmont High School, Wednesday, 8 p.m. Regional Final: at Springfield High School, Saturday, 7 p.m. Region 12 vs. Region 11, Thurs., March 21 at Jerome Schottenstein Center, 12 p.m. Region 9 vs. Region 10, Thurs., March 21 at Jerome Schottenstein Center, 2 p.m.
Division III State Championship: Sat., March 23 at Jerome SchottensteinCenter, 10:45 a.m.
No. 6 Bristolville Bristol (21-4) vs. Richmond Heights (19-6) at Canton Fieldhouse, Tuesday, 6:15 p.m.
New Middletown Springfield (20-5) vs. Greenwich South Central (20-4) at Canton Fieldhouse, Tuesday, 8 p.m. Regional Final: at Canton Fieldhouse, Friday, 7 p.m.
Columbus Grove (19-5) vs. Toledo Maumee Valley Country Day (18-6) at Bowling Green State University, Stroh Center, Tuesday, 6:15 p.m.
Hicksville (22-2) vs. No. 2 Convoy Crestview (23-1) at Bowling Green State University, Stroh Center, Tuesday, 8 p.m. Regional Final: at Bowling Green State University, Stroh Center, Friday, 7 p.m.
Coal Grove Dawson-Bryant (17-6) vs. No. 1 Berlin Hiland (25-1) at Ohio University, Convocation Center, Tuesday, 8 p.m.
Sugar Grove Berne Union (19-8) vs. New Boston Glenwood (18-6) at Ohio University, Convocation Center, Tuesday, 6:15 p.m. Regional Final: at Ohio University, Convocation Center, Friday, 7 p.m.
Springfield Catholic Central (19-3) vs. No. 3 St. Henry (22-3) at Kettering Fairmont High School, Tuesday, 8 p.m.
Fort Loramie (19-7) vs. Jackson Center (20-5) at Kettering Fairmont High School, Tuesday, 5:30 p.m. Regional Final: at Kettering Fairmont High School, Friday, 7 p.m. Region 15 vs. Region 16, Fri., March 22 at Jerome Schottenstein Center, 12 p.m. Region 13 vs. Region 14, Fri., March 22 at Jerome Schottenstein Center, 2 p.m.
Division III State Championship: Sat., March 23 at Jerome Schottenstein Center, 5:15 p.m.
https://www.sunburynews.com/wp-content/uploads/sites/48/2019/03/web1_Colbi-Borland-at-state-indoor.jpgColbi Borland at state indoor track meet.